Review: You’d be forgiven if all you took away from Gin-iro no Kami no Agito (Origin ~Spirits of the Past~) soundtracks were KOKIA’s heavenly performances. She infuses every note and line of the formidable opener “Chouwa Oto” with a sense of sorrow and tragedy that reveals the extent of the catastrophe that has befallen much of the world. And then there’s “Ai no Melody” which is nothing short of heartfelt and stirring, with a tenderness that exemplifies love perfectly. But as good as KOKIA’s vocals are, one would do well not to overlook Taku Iwasaki’s compositions for the BGM. In Gin-iro no Kami no Agito, Iwasaki’s works are of the classic variety; that is, they’re closer to the dynamic, energetic, but also deeply emotional orchestral scores in anime like the Rurouni Kenshin OVAs and less so the hit-or-miss fusion of diverse genres like hip hop and electronica for Ben-To and [C]. Listening to this classic Iwasaki is refreshing in a nostalgic sort of way; it brings me back to a time where I naively thought that Iwasaki could do no wrong. And at this juncture, he doesn’t do any wrong, conjuring forth an engaging, thematically cohesive score. Thematic cohesiveness is important because it’s what helps to make a soundtrack all the more memorable and uniquely identifiable. Here, the melodies fuse together with the show’s essence, with tracks like “Agito to Kain” which fire us up with its quick tempo and brassy fanfares. The cyclone of energy that issues forth immerses us into the movie’s adventuresome spirit as the music cultivates a youthful exuberance, heard in the strings’ playful lilts, featuring both a brashness and naiveté that slowly shifts as the soundtrack progresses. The boundless, childlike joy soon gives way and the story expands its scope to become grander. Gone is the feel of innocent explorations and more ominous sounds settle in, accompanied by militaristic rhythms and melodies. The first glimpse of this, “Dai Kouzui,” opens up with a sound that dips in melancholy waters briefly before a dissonant sequence summons a fiery feeling of urgency as the strings and percussion set the stage for the rumblings of war and the grimness that ensues. “Kako Kara Kita Otoko” raises the bar just a bit higher, starting with a set of ominous chords which then build up wonderfully through a crescendo that depicts the strain and struggle the characters experience as they toil on the brink of tragedy and despair. But the part following the climactic flute trill is where the action really flows through, as the brassy clarion calls carry an aura of glory that is very awesome to behold. Other tracks like “Chikara no Bousou” contribute to this conflict-driven mood through the right mix of melodic dynamism to depict big plans going underway as well as the use of chaotic tittering airs, crashing cymbals, and harsh melodic lines to mark the throes of conflict. As prominent and as engaging as the action tracks are, Toola’s emotional struggles in the anime are also depicted rather well through her delicate, forlorn theme. In “Toola,” the woodwinds and strings give her character a sense of fragility as well as a great weight borne by her desire to restore the world to match her memories of it. As the movie progresses, her attitude changes, and the music reflects this, particularly through “Agito to Toola 2,” where her feelings grow more uncertain about the “correct” course to take. The beautiful yearning piano heard in “Tsuki ga Kowareta Hi” follows up on that uncertainty by adding a sorrowful tone to the mix, illustrated through the dissonant chords near the end of the piece which reveal the extent of the inner conflict. But the resolution is in sight. In “Istolk wo Yamero,” the strings initially start out with a sense of melancholia, but with the trumpet’s entry, the general mood soon swells with contentment. This contentment grows more optimistic in “Boku Tachi no Mirai no Tami ni” to the point where euphoria takes hold and the music builds up to a crescendo, topped off with an exultant flourish that left me feeling upbeat. The mellowness of “Mori to Nin wo Tsunagu Mono” that comes afterward wraps it up nicely with a peaceful, relaxed melody that gives the listener hopeful for the road ahead as man and tree coexist in harmony. 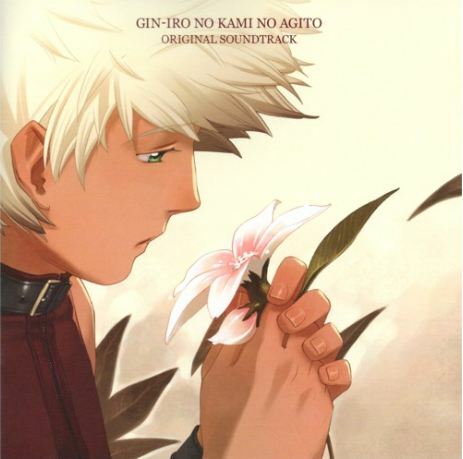 Gin-iro no Kami no Agito’s soundtrack came at a time where Iwasaki was allowed to focus on the fundamentals of good composing and less concerned with meshing together weird genres. With that in mind, I prefer the old-school Iwasaki since his more recent experiments have ironically grown stale. Although many of his older works do well to remind me of how engaging and consistent Iwasaki can be when it comes to setting the stage and engaging our emotions, it’s in this movie’s score that Iwasaki demonstrates his capabilities and musical flourishes to weave together a work that rivals only the Kenshin OVAs as Iwasaki’s best. I haven’t had a good listening of this soundtrack yet, but I wholeheartedly agree with you on KOKIA and the Kenshin OVA’s OSTs, I have bought a CD set of hers and listened countless times to the Kenshin OVA’s OSTs. Definitely agreed since I’ve been listening to KOKIA’s Pearl collection recently and have enjoyed her performances quite a bit on the album. If you’re a fan of the Kenshin OVA’s, this album should be up your alley since the orchestrals and emotions that come forth really make for an enjoyable listen all around. Ahh! Was playing around the idea of writing for this. But great review nonetheless! KOKIA is sublime in the opening, probably one of the best openings I’ve seen from an anime movie. Always sends me shivers. Really happy to see this here! Epic is pretty much the best descriptor to apply to this soundtrack. Heck, I don’t think there’s an Iwasaki soundtrack that’s more epic than this. Others like TTGL are more ambitious, certainly, and that OST is to be commended for trying so much. But when you get into old-fashioned instrumentation and whatnot, Gin-iro no Kami no Agito is solid through and through. I do voice my opinion again to say that I find the score for this show far more spectacular than the two KOKIA tracks included. KOKIA is a wonderful singer and all, but Iwasaki really gives this show its setting and flavor with the score he contributes. KOKIA is just a nice bonus on the side. Onto things that make this soundtrack so great: One thing I love about this is its cohesiveness. This quality is mostly due to the recurring use of several motifs. Giving the OST a good deal of its exotic flavor is the melody first heard in “Agito to Kain”, not to mention the battle motif that has what sounds like some Spanish influence in its first few bars. But most importantly, there is the token main theme that is doubtlessly the glue that holds the soundtrack together. In the pensive but warm “Toola” to the mysterious “Kikan Shinden”, it pops up in a different guise each time. These variations culminate in the awesome “Boku Tachi no Mirai no Tame Ni”, most certainly my favorite track on the disc. With an introduction that gradually builds up more and more in power, the track segues perfectly into a grand rendition of the main theme, the melody soaring joyfully over the impassioned waves of sound roiling underneath. I could ramble about this track for ages, but I think you get the idea… In any case, what I’m trying to say is that the way Iwasaki uses these recurring motifs and themes is what gives this OST its distinctive personality. When you pick any track from this disc, you know that what you’re listening is THE Gin-iro Kami Agito OST and no other. Of course, it takes more than just recurring themes to make me love a soundtrack (There are plenty of other albums out there that could do with less repetition). Iwasaki takes these motifs and does something different with them in nearly every track. And everything he does, he does it just… really really well. The tracks don’t feel empty or boring, each saying what they want to say very concisely. Some tracks that are particularly well put together (not that that’s saying much when every track is really good), include “Taizai Kyouka”, where short and slightly goofy woodwind notes are overlaid with an exotic melody resulting in the perfect mixture of playfulness and foreign allure. Atmosphere aside, the phrasing and build up is masterful, as demonstrated best in the action tracks. “Soukougeki” doesn’t bother with a boring repetitive drumline that stays static for two minutes. Instead, it treats us with a constantly shifting landscape of racing notes and ever increasing tension. And of course, I’ve already ranted about “Boku Tachi etc etc”. It’s this kind of attention to detail and manipulation of atmosphere that I really have to laud Iwasaki for. Ghibli + Iwasaki! What could go wrong? It really seems that Ghibli films allow their composers to really let out all the stops. I’ve always been sort of curious to see what Iwasaki could do with Ghibli’s resources backing him up. Especially when out of all of Iwasaki’s soundtracks, this one seems the most Ghibli-like in its thematic cohesiveness. Too bad it looks like they have their own stable of composers that they rely upon. Also, KOKIA is awesome, but the piano bits in “Ai no Melody” are so fitting and the vocal and instrumental components meld pretty seamlessly. Loved this soundtrack! Besides KOKIA being my favorite vocalist, Iwasaki’s soundtrack was polished and worked just right in the movie. “Mori to Nin wo Tsunagu Mono” is a track that embodies “old school Iwasaki” so well. I definitely agree that while it’s fun to see him experiment with genres and styles (TTGL, Katanagatari), his more traditional work is vastly underrated. Great stuff. And with “Mori to Nin wo Tsunagu Mono”… man, I just want to hear him compose those smooth, wistful tunes like he used to. Certainly older works of his deserve more attention and not just the TTGL extravaganza and on. Which is why the Katanagatari soundtracks were so good. ‘With best wishes’ is probably one of his best pieces in recent times, echoing that wistfulness that he does oh so well. Hmm, isn’t this a Gonzo movie? It saddens me that a lot of the anime that I find there aren’t soundtracks that I can purchase for them. Angel Beats and now Gin-iro no Kami no Agito. Well, it’s nice, but no more than that. Nothing outstanding here. So I must say that this work is not a rival for compositions which he made for “Rurouni Kenshin”.